Do You Remember... "Stories of the Century"
“The official newspaper files of the early west record many stories of famous and notorious characters of that period,” intoned the voice of Jim Davis as railroad detective Matt Clark, star of the Republic Pictures produced half hour TV series “Stories of the Century” which ran in syndication for 39 episodes from January 1954 to March 1955. Each week Matt Clark was assigned to go after a famous outlaw, who, somehow, always seemed to have some sort of outlawry connection to the Southwestern Railroad. Certainly, all stories of these famous badmen were fictionalized, with Matt Clark always there, no matter what the time period or location. However, each episode did contain the bare essentials of truth about the outlaws, whether it be Billy the Kid, Belle Starr, John Wesley Hardin, the Younger Brothers, or whomever. Approaching 39 episodes, scriptwriters were running out of “name-brand” outlaws and began resorting to lesser known characters such as Milt Sharp, Nate Champion, Burt Alvord and Rube Burrows. Casting was terrific, with each outlaw played by some of the top western actors—Marie Windsor was Belle Starr, Richard Jaeckel was Billy the Kid, Don Haggerty was Sam Bass, Donald Curtis was Johnny Ringo, George Keymas was Chief Crazy Horse, Leo Gordon was Bill Doolin, Jack Elam was Black Jack Ketchum, Don Barry was Milt Sharp, Gregg Palmer was Jack Slade, etc. “Stories of the Century” was Republic’s first venture into TV production, something Pres. Herbert Yates resisted as long as he could. Produced under the marquee of Studio City Television Productions, the associate producer of the series was Edward J. White. Bill Witney directed 30 episodes and Franklin Adreon helmed nine, both men making plentiful use of Republic’s exhaustive stock footage. Much of the railroad footage, including the opening scene of a train, came from Roy Rogers’ “Nevada City” (‘41). Expert photography for the 39 episodes was provided by old Republic standby Bud Thackery. Star Jim Davis was born August 26, 1909, in the small community of Edgerton, MO. The son of an undertaker, he excelled in high school sports, then attended William Jewell College in Liberty, MO. A series of odd jobs came his way before he became a salesman for the Quaker State Oil Company headquartered in Kansas City. In California on a sales trip, the film industry began to interest him. Obtaining an agent, Jim landed a contract at MGM. Just as his career was beginning, WWII came along and Jim enlisted in the Coast Guard. Returning from service, he was picked up by Warner Bros. and co-starred in “Winter Meeting” opposite Bette Davis. Unfortunately for Jim, the film flopped. Perhaps fortunately for western fans though, as the lanky gentleman soon found his way into westerns at Republic (“Fabulous Texan”, “Hellfire”, “Brimstone”, “Savage Horde”, “Oh! Susanna”, “Ride the Man Down”, etc.) and other studios (“Silver Canyon” at Columbia, “Cariboo Trail” at 20th Century Fox, “Cavalry Scout” at Monogram, etc.). It really wasn’t until “Stories of the Century” that Jim began to play anything but heavies. The successful series changed that and he followed up with leads in “Last Stagecoach West”, “Badge of Marshal Brennan”, “Noose for a Gunman”, “Gambler Wore a Gun” and others. Still, many saw him as a heavy, and he appeared as such after “Stories…” in “Duel at Apache Wells”, “Raiders of Old California”, “Toughest Gun In Tombstone” and others. TV beckoned as well, several excellent “Gunsmoke” episodes, even another series in ‘74, the now forgotten “The Cowboys”. Jim was back on top as oil baron Jock Ewing when “Dallas” debuted to huge ratings in ‘78. Its success brought him late in life fame and financial security. Unfortunately, Jim suffered from cluster headaches and ulcers for years and the long hours caused his health to fail. He was under treatment for a brain tumor when he died at 71 April 26, 1981. 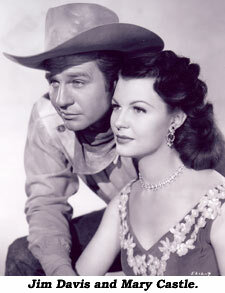 His initial “Stories…” co-star Mary Castle (left) was born Mary Ann Noblett in Pampa, TX, January 22, 1931. Originally a model, a Columbia talent scout spotted her and the studio groomed her as a “threat” to Rita Hayworth. 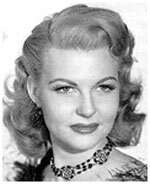 Always a rather “quiet” actress, she appeared in several Columbia westerns with Charles Starrett, Jon Hall and Gene Autry, but the reddish-blonde never really “clicked” until her work on “Stories of the Century”. 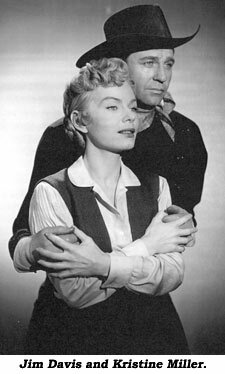 After the series, she continued to work (including a role in Davis’ “Last Stagecoach West”) until ‘62 (a small role on “Gunsmoke”) and was married in ‘71. Mary died at 67 on April 29, 1998. Kristine Miller, born Jacqueline Olivia Eskeson circa 1925 in Argentina, is the daughter of a Standard Oil Company VP. Her mother was a concert singer. Her family left South America when that branch of Standard Oil failed and moved to Copenhagen, Denmark, then the U.S. in ‘39 shortly before the Nazis took over. Her film career began in ‘46 under contract to producer Hal Wallis at Paramount. 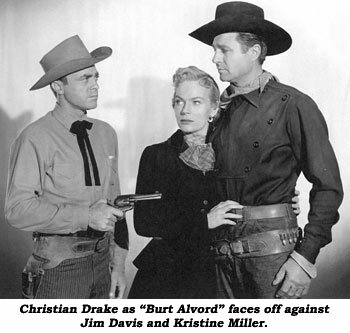 Until “Stories…” westerns were never a large part of Kristine’s career. Following the series, she co-starred in several. She retired in the early ‘60s, moving to San Francisco with her husband. Today she lives in Carmel, CA. The action-packed “Stories of the Century” was one of the best western half-hours of the ‘50s, with movie-like production values from Republic.